« Being A Victim Apparently Has More Status Now Than Being A Gold Medal Winner -- Ryan Lochte Channels "Jackie"
Why did trolley cars go away? They are fixed in their route and conflict with (and hit) cars. Everyone saw that they were less efficient and more expensive than buses. Somehow urban planners fell in love with an antique technology. Of course the reason is that they are nicer than buses. The cost is so outrageous. In Phoenix it makes even less sense because it is so spread out. I don't take public transit because I live in the suburbs, but even if I go to downtown Chicago, the uncertainty of the bus and train system puts me off. I always end up having to walk a long way at some point and try to catch a bus/train that comes when it feels like it. If you have a stroller and shopping bags, just too much fun. "By shifting transit dollars into a mode that requires 10x more money to move a single passenger"
To the transit bureaucrat, this is not a bug, but a feature. They view light rail as a perpetual money machine. You should see the debacle that has taken place in Seattle, where every govt project ends up way, way over budget, and produces precious little. They put in a light rail line from the airport to downtown Seattle, were *billions* over budget, and are determined to make the same mistake to the suburbs. 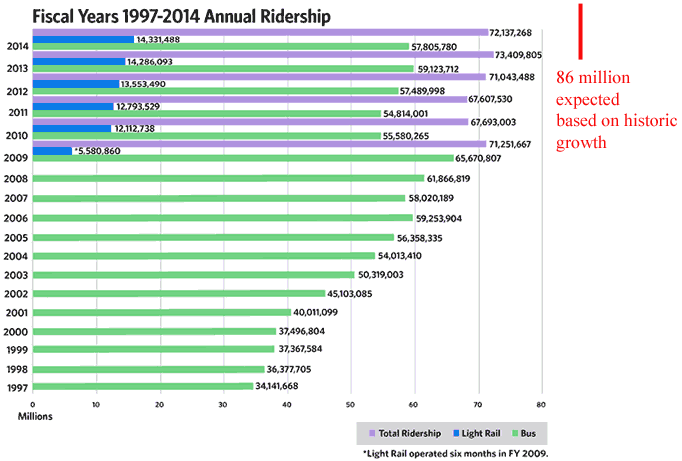 Ridership is abysmal and so it has to be subsidized. The problem isn't light rail itself. It's old technology, yes, but there's enormous pressure from the construction industry on the politicians to do this stuff. The goal is not to move the masses, but to provide subsidies to the industry and line the politician's pockets. That's why the pols are pushing ahead with light rail in San Antonio when the voters voted 70% against it. To the urban planner, the low cost and flexibility of buses are problematic and the high cost and inflexibility of rail transit are key advantages. With high-cost rail transit, the planner's decisions can have real teeth. The cost drains funds from buses and road building & maintenance while the inflexibility of rails is intended to force development to follow the rail corridors the planners have laid out. If this all works as intended, rail will be left as the only good option for getting around (in comparison to an increasingly threadbare road network and bus system) and proximity to rail stations will become a driving force behind (high-density) development. Orrrrrrrrrrrrrrrrrrrrrrrrrrrrrrrr, driving people out of the city to the suburbs, and staying there. And imagine if they had spent that money on more buses enabling more frequent pickups and better routes, or on extended hours. I live in Seattle, I'd love to see hard numbers like the one's that are posted here for our region. Another reason why politicians, particularly liberal politicians, love "rail" projects is because that is what the "cosmopolitan" Europeans have for transportation as well as the glamorous East Coast cities. They want to be cool like the New Yorkers or Europeans whom they model their lives on. That is why they cannot recognize the differences in population density impacting their precious subway-lites. The other aspect they really don't care about is that the existing subways in New York and Boston might be huge successes, their construction was done with low wage, Irish immigrant labor. When you try to build even a lite rail using the exorbitant unionized labor of modern times it is simply not fiscally feasible. And, sometimes that is hard to understand. In Minnesota there exists a "commuter" rail that runs to downtown Minneapolis from the outer northwest suburbs. This commuter rail is a little over 40 miles long but runs along previously existing track. Including the terminous at Target Center Field, there are 7 platforms in total. Total cost, including a $107.5 million payment to BNSF for rail use, was $317 million. That is a huge when you consider what the system really delivers. A handful of runs in the morning and a handful of runs in the evening. It is amazing that tax payers are so easily swindled. Construction projects, such as rail lines, pay off for politicians in several ways that extra spending on buses don't. Of course there are lots of jobs for expensive union construction workers. In addition, there are big pay days for investment bankers, environmental consultants, engineers, bond lawyers and all the other experts needed to get a big capital project done. And all those who profit will be appropriately grateful to the elected officials who made all this possible. Note that I am not suggesting bribery, although certainly that sometimes happens. This is just the normal give and take of our political system. You are making the mistake of believing that the light rail is for the commuters or to improve traffic flow. Au contraire, mon frère. Light rail is for the unions. It is wealth transfer in return for votes and power. Simple as that. On the other hand, the $2.5 billion Sound Transit capital expenditure over a decade to construct and buy vehicles and equipment for the light rail line has vastly exceeded the approximately $100 million per year capital expenditure for Metro Bus equipment and facilities over a comparable time period. You might also read this article in the Seattle Times about the cost overruns on the light rail project so far. The government "estimates" it is 86% over original stated cost. 86%! 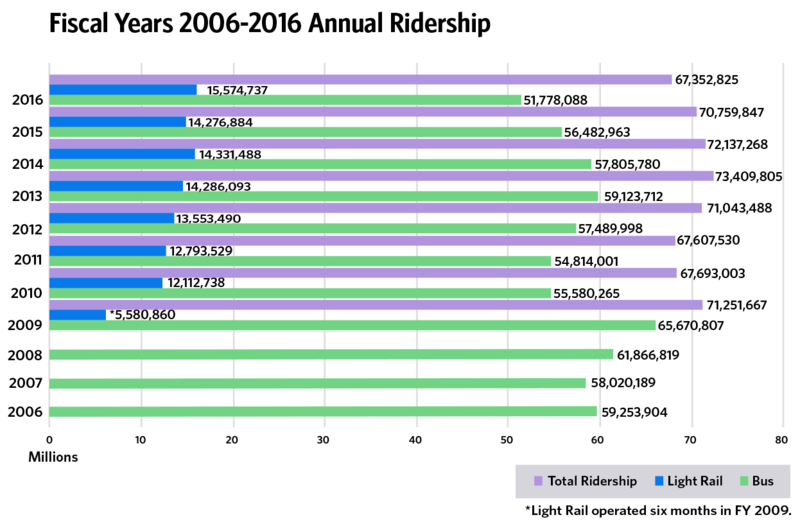 The 2015 data for Seattle's light rail line indicate that it handled about 11.5 million (unlinked) boardings. Its operating costs were around $61.7 million and it collected about $18.2 million in fare revenue. So it ran an operating deficit of roughly $43.5 million, or about $3.77 per boarding. This doesn't count the capital costs Craig mentioned. But escaping is harder to do in Phoenix because, to a large extent, it contains its own suburbs. Phoenix is huge -- at over 500 square miles, it's 3 1/2 times the size of Detroit and about 12 times the size of San Francisco.